1The International University of Health and Welfare, Shioya Hospital, Yaita, Tochigi, Japan; 2Sanikukai Family Clinic, Funabashi, Chiba, Japan. Received April 8th, 2011; revised May 13th, 2011; accepted July 20th, 2011. Lipoma of the stomach is unusual in gastric tumors . And it rarely prolapses into the duodenal bulb. We report an extremely rare case of lipoma in the antrum of the stomach which prolapsed into the duodenal bulb, leading to the development of a duodenal ulcer, speculated to have been caused by the friction of its head against the duodenal mucosa. In this case, although the duodenal ulcer scarred after the administration of a proton pump inhibitor, the symptom of epigastric discomfort continued, suggested to be due to prolapsing. So the lipoma was resected on a laparoscopic operation. After the operation, her symptom disappeared and the duodenal ulcer maintained scarring status without dosage of gastric acid inhibitor. An 84-year-old woman visited our hospital because of epigastric pain and discomfort of 3 months’ duration. She took hypotensive drugs for hypertension, but never NSAIDs. She had a small physique and had no fever, anemia, or jaundice. Laboratory tests showed normal blood cell counts, a normal blood chemistry, and no inflammatory reactions. Serum anti-Helicobacter pylori (Hp) antibody was negative, and the serum gastrin level measured later was within normal limits. On gastrointestinal endoscopy, a 35-mm submucosal tumor (SMT) with erosions in part was observed on the anterior wall in the antrum of the stomach, prolapsing through the pylorus into the duodenal bulb (Figure 1(a)). The cushion sign of the SMT was positive (Figure 1(b)). 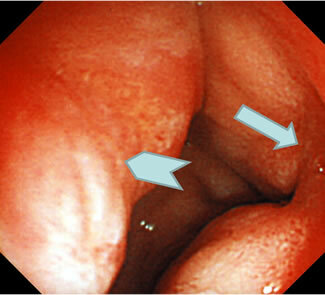 The top of the SMT, prolapsing into the duodenal bulb, was near the posterior wall of the duodenal bulb, and a huge ulcer was detected at the same site of the duodenal bulb (Figure 1(c)). The SMT was pulled back from the pylorus with biopsy forceps, but it prolapsed easily into the duodenal bulb. On endoscopic ultrasonography (EUS), the SMT was indicated as a hyperechoic mass arising from the submucosal layer (Figure 2(a)). On a CT scan of the abdomen, about 30-mm low-density mass was observed in the antrum of the stomach. Figure 1. Initial gastrointestinal endoscopic findings. 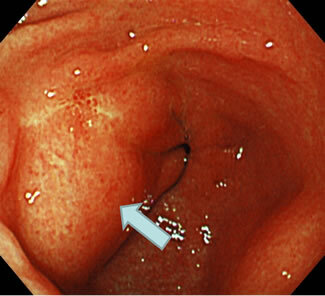 (a) An SMT was observed in the antrum of the stomach, prolapsing into the duodenal bulb (arrow). (b) Cushion sign of the SMT was positive. (c) The top of the SMT was near the posterior wall of the duodenal bulb (arrow head), and a huge ulcer was detected at the same site as the duodenal bulb (arrow). Figure 2. EUS and repeated gastrointestinal endoscopic findings. 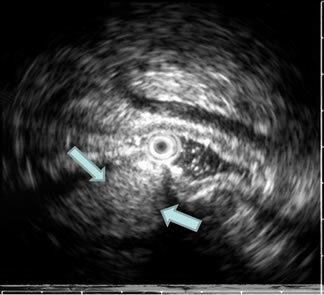 (a) The SMT was identified as a hyperechoic mass arising from the submucosal layer on EUS (arrows). (b) The top of the SMT was still erosive (arrow head) but the duodenal ulcer had scarred arrow), on repeated gastrointestinal endoscopy. wide and its stalk was thick. Therefore, a laparoscopic operation was performed: the lipoma was tracted out of the stomach through an incision made in the anterior wall near the lesser curvature of the antrum, and it was resected. The resected specimen was 3.5 × 3.0 cm, and a subepithelial part of it showed a yellowish color (Figure 3(a)). 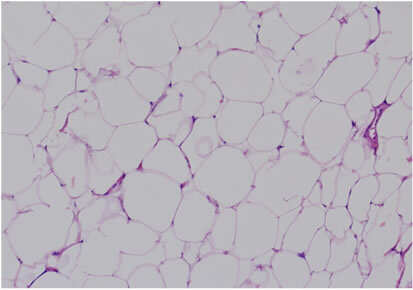 The tumor was definitely diagnosed as a lipoma because the proliferation of mature fat cells was detected in the submucosa histologically (Figures 3(b) and (c)). After the operation, her symptom improved and the duodenal ulcer maintained scar status without administration of gastric acid inhibitor. Lipoma of the digestive tract is a benign tumor in which the proliferation of mature fat cells is observed in the submucosae histologically. Small-sized lipomas are mostly asymptomatic, are incidentally detected on endoscopic examination or contrasting X-ray study of the digestive tract. However, large-sized lipomas occasionally cause abdominal pain, gastrointestinal bleeding, or ileus due to their invagination. Figure 3. Finding of the resected specimen. (a) The resected specimen was 3.5 × 3.0 cm, and its subepithelial part showed a yellowish color. 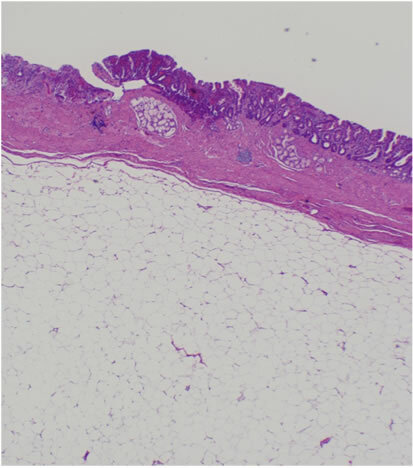 (b) and (c) The proliferation of mature fat cells was detected in the submucosa histologically (HE staining, (b) low-power view, (c) high-power view). of gastric acid . However, in the present case, the lipoma itself showed no gastrointestinal bleeding, although erosions were found on its surface. Reportedly, gastric tumors rarely prolapse into the duodenum [5-7]. Also, in prolapsing gastric tumors, it has been reported that early gastric cancer is the most common, followed by advanced gastric cancer, GIST, and lipoma, which is rare [5-7]. A MEDLINE and Japan Central Revuo Medicina-based search of the literature published between 1950 and 2008 using the key words “lipoma”, “stomach”, and “prolapse” revealed only 7 similar Japanese cases [5-7]. These 8 cases including the present case showed a predilection for female (females: 6, males: 2) [5-7]. Also these patients ranged in age from 46 to 91 years with a mean of 68.3 years [5-7], suggesting a predilection for the aged. Regarding symptoms, nausea/ vomiting or epigastric pain/discomfort were observed in 5, melena in 1, and no symptoms in 1 [5-7]. In all cases, lipomas were found in the antrum. These 8 lipomas ranged in size from 1.9 to 6.0 cm, and concerning the form, the semi-peduncular type comprised 7 and the sessile type comprised 1 [5-7]. As for treatment, endoscopic polypectomy was performed in 2 and surgical operation in 6 [5-7]. Laparoscopic operation was performed only in the present case. 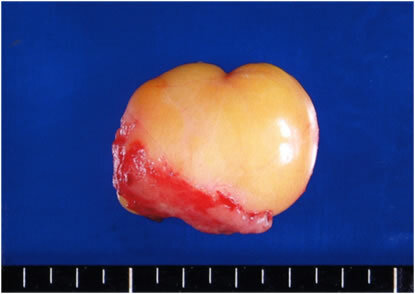 A preoperative diagnosis of lipoma was possible in 3 [5-7]. The so-called “ball valve syndrome (BVS)” was defined by Hobbs et al. , in which severe abdominal pain, vomiting or abdominal fullness occurs suddenly due to the prolapsing of gastric tumors or mucosae into the duodenum and blocking of the pylorus. In these 8 cases, BVS was noted in 3 [5-7]. In the present case, BVS was denied because the symptoms were neither severe nor sudden. It has been reported that the prolapsing of gastric tumors requires the essence of several conditions, as follows : the tumors must be peduncular or semi-peduncular forms, they must be located on the greater curvature or anterior wall, they must show mobility and be of a sufficient weight, and peristalsis or relaxation of the pylorus must exist to push out the tumors. Through an analysis of the reported cases, prolapse was mainly observed in small and aged females. The present case corresponded well with these conditions and features. In this case, it was extremely peculiar for a duodenal ulcer to be detected on the posterior wall of the duodenal bulb near the top of the lipoma. The patient had no history of duodenal ulcer, had never taken NSAIDs, nor had been infected by Hp. Her serum gastrin level was also within normal limits. And after the resection of the lipoma, the ulcer maintained scarring status without gastric acid inhibitor. Therefore, regarding the genesis of this duodenal ulcer, it was speculated that the duodenal mucosa had rubbed against the top of the lipoma, causing the ulcer. Furthermore, because the ulcer had scarred after the administration of the PPI, it was also speculated that gastric acid had advanced the erosions caused by rubbing to the ulcer. Based on our search, up to the present, there has been no report on gastric tumors, comprising lipomas, prolapsing into the duodenum and causing a duodenal ulcer, as in this case. Thus, the present case was rare. In this case, the lipoma always showed prolapse in all endoscopic examinations, suggesting that the top of the lipoma frequently rubbed against the duodenal mucosa. Further, the top of the lipoma was movable in the duodenal bulb, suggesting that it easily rubbed against the duodenal mucosa. And it was also speculated as one of the reasons that the duodenal mucosa is thin and weak comparing with the antral mucosa covered the surface of the lipoma. We reported a rare case of lipoma of the stomach which prolapsed into the duodenal bulb, leading to the development of a duodenal ulcer, speculated to have been induced by the friction.